Good condition but a slight mark on one of seat cushions which is hidden underneath. Overall width 210cm, height 80cm. Ivory & Black Leather Cooper 3 Seater DFS Sofa. Sneaker White. Condition is Used. Collection in person only. Bought from DFS few years ago for £699. Ex DFS 3 seater power reclining sofa, covered with black genuine leather all around. Solid couch with plenty of life left on it! 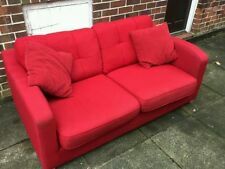 2ND HAND SOFA IN VERY GOOD CONDITION. SOFA WILL BE SOLD AFTER FULL VACUUM AND CLEANING SERVICE DONE ALSO POLISHED WITH QUALITY WAX! Bought this from DFS last year for £1000. In excellent condition other than the slight tear and the paint mark as shown in the pictures. Also has a USB port near the recliner button which is on both sides of the sofa. Comes with glides which are purchased separate which makes it easier to move the sofa. Good quality leather manual reclining sofa finished in chocolate brown colour. Surfaces in lovely condition, no teras or wear areas. Only few minor scratches but hard to notice. 2ND HAND LEATHER SOFA IN LOVELY CONDITION. Quality leather manual reclining sofa finiahed in brown with silver handles. Surfaces in lovely condition, no teras or wear areas. Only few minor scratches but nothing really visible. 2ND HAND LEATHER SOFA IN LOVELY CONDITION. 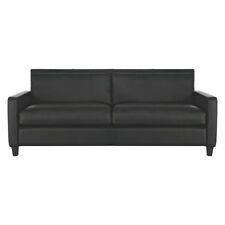 Black 3 seater sofa, 6 months old and hardly used, suitable for all, very comfortable and easy to clean. A3 seater but can potentially seat up to 4 people. Anew looking sofa in excellent condition (no scratches, no stains etc). The feet are very strong and dark brown made from wood. Etienne Platt Outer Large 3 Seater Stylish Grey Fabric Sofa With Foot Stall. Etienne Large 3 Seater Stylish Grey Fabric Sofa. Condition is Used. Collection only. Excellent condition 3 seater chocolate brown leather sofa with matching chair and footstool. Bought from DFS 6 years ago with moderate use for 2 out of the 6 years. Past 4 years have been in a spare room with very little use. This has been a wonderful piece of furniture. Full leather 3 seater sofa, a chair and footstool. Bought from DFS, good quality black leather, soft and has visible signs of wear, as to be expected with its age. The Sofa comes with 2 black leather cushions and the chair with one. Smoke free home. We have a small dog who is groomed once a week and cleaner than most humans. We can deliver locally if someone can help with lifting as we have a van. Grey Fabric Sofa 2 and 3 Seater from DFS for living room . Used. Condition is Used. Collection in person only. Leather Sofas 3 Seater And 2 Seater. Condition is Used. Collection in person only. There are a few small marks on this as you would expect from used condition, but plenty of life in this still. The covers on the back cushions and seat cushions are removable so you can wash them. The feet are of light wood colour. For sale: DFS 3 seater fabric sofa bed (grey black). Fully treated with anti-stain agent by DFS. Side sections are detachable for moving sofa around. Sofa will be disassembled ready for pick up. From DFS. - easy to clean. Only selling due to change of decor and colour scheme. Excellent condition from smoke free home. Buyer will need to collect. Left hand corner chaise sofa with matching rectangle ottoman at end. Six scatter cushions in brown/beige patterns (2 x velvet). Brown faux suede back and arms. Man-made woven fabric for seat cushions and scatter pillows. DFS 3 seater sofa and large armchair suite in burgandy velour. DFS 3 seater sofa and large armchair suite in burgandy velour. . Condition is Used. Collection in person only. 3 seater DFS sofa.Brown fabric. Excellent condition. Used 2 Seater Leather Sofa, Black, excellent condition. 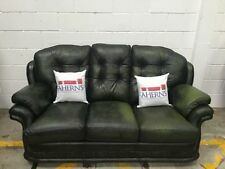 Used 2 Seater Leather Sofa, Black, excellent condition. . Condition is Used. Collection in person only. Condition is Used. Collection in person only. These are good to fair condition with the smaller sofa the better of the two. Due to the light and screen difference, the item's colour may be slightly different from the pictures.